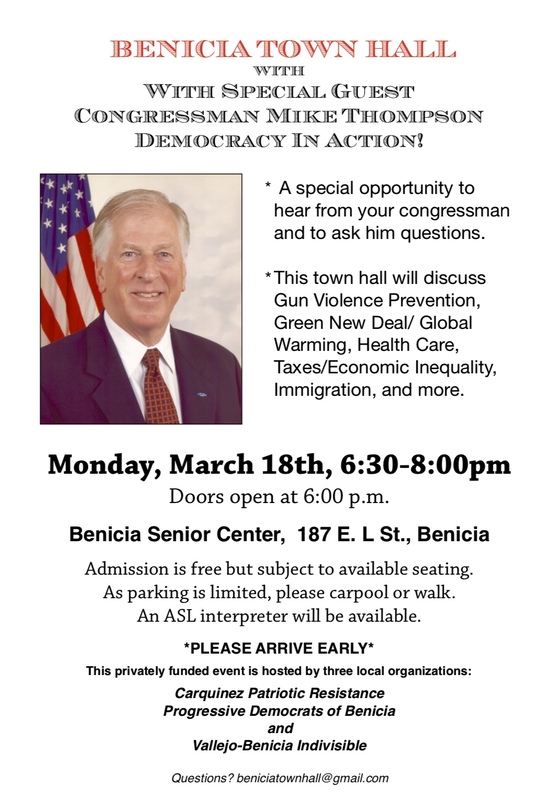 Congressman Mike Thompson will meet with us at a Town Hall here in Benicia TODAY, Monday, March 18. Co-sponsored by Progressive Democrats of Benicia, Carquinez Patriotic Resistance, and Vallejo-Benicia Indivisible for Justice, the program will be held at the Benicia Senior Center, 187 East L St., 6:30 to 8:30 (doors open at 6:00). 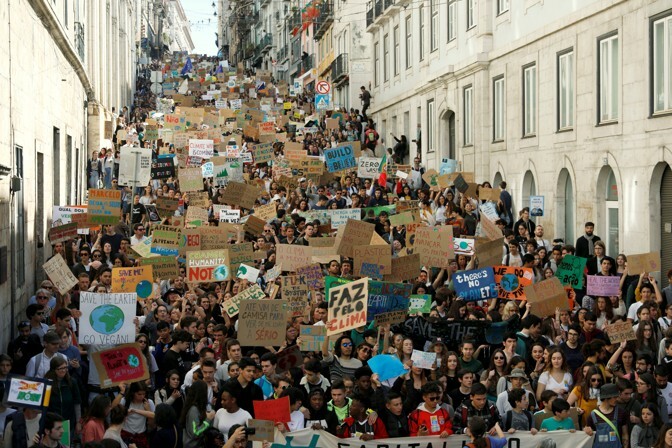 The term Green New Deal might remind Americans of high-school history class. What was the original New Deal about, again? Most kids are taught that it was a decidedly left-wing project to end the Great Depression, a series of big-spending government programs such as the Public Works Administration, with its schools and stadiums. That impression colors the debate over the Democrats’ important new proposal: Conservatives warn of catastrophic federal debts while liberals insist that top-down investment was and is crucial to managing disaster. But the high-school narrative is not quite right. It leaves out the parts of the New Deal that encouraged private investment. At the center of this other New Deal was the Reconstruction Finance Corporation (RFC), an independent agency within the federal government that set up lending systems to channel private capital into publicly desirable investments. It innovated new systems of insurance to guarantee those loans, and delivered profits to businesses in peril during the Depression. Unionists, farmers, and consumers benefited as well, all without the government needing to spend a dime of taxpayer money. Under Hoover, Jones was appointed to the Reconstruction Finance Corporation, which was tasked with recapitalizing regional banks. Like the other men on Hoover’s RFC, Jones was a banker—he was president of the Texas Commerce Bank system—but he was also a prominent real-estate developer and an original investor in the company that became Exxon. When FDR came to power, he promoted Jones, who had been a Democrat since the heady populist days of William Jennings Bryan, to the head of the RFC. Jones understood well the need to take risks, and how risk-averse the world of finance had become during the Depression; his basic mission was to restore safe, long-term investment opportunities. Jones focused first on housing. He appointed James Moffett, a vice president of Standard Oil of New Jersey, as head of the Federal Housing Administration. With the assistance of National City Bank employees “loaned” to the FHA, Moffett and others designed mechanisms to channel the money sitting in banks back into the world in the form of mortgages. Their key innovation was to have lenders chip into an insurance pool, organized by the federal government. If a borrower defaulted on a mortgage, the lender would be paid out of the pool in low-yielding bonds. The lender would not lose the principal of the mortgage, but neither would the lender have an incentive to do business with the obviously uncreditworthy. The FHA-administered insurance pool made mortgages safe for banks again. Moffett correctly predicted, as he issued the first FHA guidelines, that “an investor in New York City or Chicago will be able to advance money on a home in Texas or California … with a sense of security quite as great as would be the case if the property were in the next block.” The loans started small—home-modernization loans of only a few hundred dollars—but within a year, the FHA insurance program was backing loans on houses across the country. In a few months, FHA programs lent more money than the Public Works Administration spent during the entire decade, and put some 750,000 people back to work. The FHA, as I have previously written, preserved private enterprise while accomplishing a public good. No lender had to comply with the FHA, but if he did, his business was easier to conduct. Risk-free loans with guaranteed buyers provided a strong—yet noncoercive—incentive to lend private capital. The government issued no loans and paid for no insurance, while creating new markets for lenders. Following on the success of the FHA, in 1935 Jones created the Rural Electrification Administration as a subsidiary of the RFC. Jones asked Morris Cooke, an engineer and consultant and the head of Philadelphia’s public works, to be its founding leader. Cooke was skeptical of the motives of business owners who held “a belief in the absolutism of private property.” The financially driven “holding companies” that controlled “76 per cent of the two billions of capital invested in electric light and power companies” were more concerned with maximizing profit than the needs of the people. Cooke was not opposed to profit—as long as it did not stand in the way of progress. The stumbling point for rural electrification had always been the perceived expense. No utility would string all those lines for just a few customers. All that empty space would eat up the profits. Private utilities estimated that rural electrification would cost $1,350 a mile. Cooke, unlike most Washington politicians, had spent his life reducing costs, even when supposed experts told him it wasn’t possible. He figured the real costs were much lower, and as it turned out, Cooke was right—the actual cost per mile was only $850. Getting to that lower number took some imagination. Private utilities would not bear the expense of rural electrification, so Cooke had to look elsewhere. He didn’t believe, as did WPA head Harold Ickes, that capitalism had failed—in his view only the utility companies had. Having the government build the lines was the position of “extremists,” and he was no Communist. Cooke found a middle path between big corporations and big government in the form of rural cooperatives. While urban cooperatives in industrial America had fitful starts, rural cooperatives had been a big deal since the late 19th century. They pulled together agricultural crops, branded them (think Sunkist), and then sold them around the world. Later on, these cooperatives were denounced as “communist” by utilities, but they were anything but. Their work made possible the modernization of the American farm and farmhouse, which in turn made it possible for rural America to buy electrical goods from private companies. They also returned a modest profit to the RFC. What’s more, once the REA demonstrated that rural America could be cheaply electrified, other entrepreneurs took notice. Rather than “crowding out” private initiative, government provided an example that worked. Most small businesses, then and now, are imitative rather than innovative. That is fine. Small business can replicate best practices rapidly through the economy, which is exactly what happened in rural America. Installment lenders stepped in to provide new services, and even the electrical utility companies began to string lines out into the country. As late as 1935, 90 percent of rural homes had no electricity. By 1940, 40 percent of rural America had electricity—a rise of 30 percent in only a few years. Ten years later, in 1950, 90 percent had electricity. Housing filled a social need, and rural electrification enabled country folk to buy electrical goods. But to really get the economy on a sounder footing, New Dealers would have to encourage investment in new industries, an imperative that dovetailed with the need to prepare for war with the Nazis. While it is now conventional wisdom that World War II ended the Depression, amateur historians rarely consider the contrary example of World War I, which brought not prosperity but ruin. The aftermath of World War I was recession everywhere, and in rural America, the recession began in 1920 and did not end until after World War II. The disparity lies in the fact that, in World War I, firms invested their own capital to expand weaponry production, only to confront the collapse of demand a year and a half later with the armistice. Manufacturers were left with overflowing inventory and a demilitarized America. In the run-up to World War II, private companies were not going to get suckered again. And banks couldn’t stomach investing the money necessary for war. The government, for its part, did not want to spend billions of dollars on state-owned weapons factories, which smacked of the fascism they sought to fight. Besides, they needed those billions to buy the guns and pay the soldiers. Somehow, however, the country had to prepare itself, and to develop advances in aerospace in particular—still a new sector but of increasingly obvious utility for the war effort. So the RFC did for planes and other instruments of war what it had done for houses and electrification: It created channels for capital investment through the Defense Plant Corporation (DPC). Like Jones, the people behind the DPC were not ideologues but practical men and women from both management and labor. William Knudsen, the president of General Motors, who had helped organize the first Ford production line, was there. The president of a major railroad, the Chicago, Burlington and Quincy Railroad, Ralph Budd was on the committee too, as well as a vice-president of Sears, Roebuck. Labor was represented by none other than Sidney Hillman, the famous unionist who helped draft the National Labor Relations Act. The DPC even had lifelong activist reformers, including Leon Henderson and Harriet Elliot. It was a committee that reflected an alliance of interests between labor, capital, and the state. These men, and one woman, positioned the DPC as an intermediary between investors and borrowers, providing capital for planes and munitions in two ways: the first as a lender, and the second through tax benefits. The loans originated with the RFC, which shunted the money through the DPC to the manufacturers. In some cases, the government nominally owned the plants, but private companies got the profits, managed the facilities, and, after the war, bought the plants. The tax benefits came in the form of accelerated depreciation schedules for war-time plant investment. Firms could normally deduct depreciation—the loss of value in equipment—from their taxable incomes, but only over a long period of time, usually 20 years. The DPC lobbied for five-year depreciation timelines, so that firms could quickly write off the entire cost of their investments. Over the course of the war, this dual system directed $25 billion into manufacturing. Nothing had ever been attempted on this scale before—or succeeded so well. While the FHA and REA were crucial for the economy, the DPC channeled the equivalent investment of 25 percent of the entire GDP in 1940. DPC financing added the equivalent of half of the entire prewar manufacturing capacity to the country by the end of the war. DPC financing reoriented the entire economy. Aerospace, which absorbed three-fifths of all DPC loans, went from making a few thousand planes in 1939 to nearly 100,000 planes by 1944. By 1943, 40 percent of the Los Angeles workforce—about 2.1 million people—worked for an aircraft company. Curtiss-Wright grew from a small firm to being second only to General Motors in size. In the postwar period, aerospace became one of America’s largest industries, and it attained that size through DPC financing. During World War II, the GDP, in real terms, doubled. After the war ended, it continued to grow at a breakneck speed, because wartime investments paid off. Under Jones, the RFC worked across economic scales, from local construction contractors to giant corporations. It did not try to fulfill a particular utopian vision of how the economy “ought to be” but worked within the system to fix the system. It relied not on abstract economic ideas like socialism or capitalism, but on practical business methods. And it worked. There was no single magic bullet, but a portfolio of opportunities. Under Jones, the RFC did not ask Congress for money. It could borrow billions from capital markets or banks. And borrow it did. But with Jones at the helm, overall, it made money. The RFC developed different projects that turned cutting-edge technology into self-sustaining commercial enterprises. Nervous businessmen said it couldn’t be done. Jones—and the rest of the RFC agencies—did it anyway. These financial lessons of the New Deal have been largely forgotten, overwritten by the story of “big government spending”—celebrated by the left and denounced by the right. Yet they’re worth dredging up. They provide many examples of how to harness private capital for public good, and help promote free enterprise, entrepreneurship, and technological innovation. The government can spend taxpayer money on the Green New Deal (and it should), but direct spending is not the only option, and if the New Deal is a good guide, not even the most important option. Government power lies not just in spending, but in helping businesses overcome risk-aversion and finance new opportunities for growth. As we imagine policies to fight climate change—certainly as crucial as fighting World War II—let’s remember how the New Deal really worked, so that we can do it again. LOUIS HYMAN is a historian of work and business at the ILR School of Cornell University, where he also directs the Institute for Workplace Studies in New York City.